Donald Trump sat down with Good Morning Britain host Piers Morgan for his first interview with an international broadcaster since he became president. Here's what we learned in 'President Trump - the Piers Morgan Interview', which aired on ITV on Sunday night. 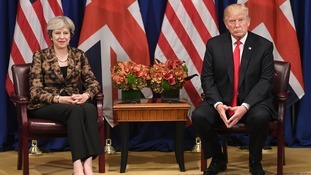 Donald Trump told ITV he would have been "tougher" than Theresa May during Brexit negotiations, adding that the EU was "not what it cracked up to what it's supposed to be" and that he had a lot of problems with it. Mr Trump said he had a lot of respect for the British Prime Minister but "would have had a different attitude" in negotiating the UK's exit from the EU. He continued that he has "a lot of problems with the European Union" since current trade deals between the US and the EU were "very unfair". Despite saying that he has "tremendous respect for women", Donald Trump told Morgan he is not a feminist. When questioned if he was a feminist, the US President replied: "No I wouldn't say I'm a feminist, I mean, I think that would be maybe going to far." Rather than being a feminist - someone who advocates for women's rights on the grounds of equality of the sexes - Mr Trump instead insisted he was "for women, I'm for men, I'm for everyone". However, the Republican added that he believes many women understand that he is "for them" and that he "won many categories of women and the women vote in the election", even when running against a female candidate. Mr Trump is expected to visit the UK later in 2018, having recently cancelled a planned visit to London for the opening of the new US embassy. Speaking to Morgan in Davos where he had just come from a meeting with Mrs May, Mr Trump said the Prime Minister had invited him to the UK twice in 2018, with one of the visits being a "state" visit, he confirmed. Later in the interview, responding to suggestions that some figures in the UK would like him to be banned from visiting the country, he said: "I haven't heard about banning. Asked if he believes in climate change, Mr Trump told Morgan that the ice caps are "at a record level". While NASA did report that the polar ice caps were at record lows in March 2017, this is due to them melting into the oceans. However, Mr Trump did say he believed in "clear air", "crystal-clear, beautiful water", and "good cleanliness". He explained: "There is a cooling and there is a heating. "I mean, look, it used to not be climate change, it used to be global warming, right? "That wasn't working too well because it was getting too cold all over the place. "The ice caps were going to melt, they were going to be gone by now, but now they're setting records. "Now they're at a record level. "There are so many things happening. "I tell you what I believe in - clear air, I believe in crystal-clear, beautiful water, I believe in just having good cleanliness and all." However, the US President did concede that he could enter back into the Paris Accord, a pledge for countries to take action to limit temperature rises to "well below" 2C above pre-industrial levels, but only if the US got a "different deal" since the last one, had in his eyes, been "terrible" for America. Donald Trump has said he is not aware of any invitation for him to attend Prince Harry's wedding to Meghan Markle in May. While it is hoped that the royal wedding will strengthen the bond between the UK and the US, Ms Markle has been a vocal critic of former reality star Mr Trump, backing his rival Hillary Clinton and suggesting before the 2016 election she would leave the US if he won. Asked if he would like to go to the royal wedding in May at Windsor Castle's St George's Chapel, Mr Trump simply said: "I want them to be happy. I really want them to be happy. When Morgan pointed out she had labelled the billionaire "divisive" and a "misogynist", he said: "Well, I still hope they're happy." Donald Trump drew international criticism in November after he retweeted anti-Muslim videos posted online by far-right group Britain First, but insisting he is not a racist, the President has said he "would" apologise for the tweets. In November, President Trump made headlines after he delayed his controversial new policy allowing elephant hunting trophies to be imported to the US, saying he needed to "review all conservation facts". The announcement came a day after his administration announced that the 2014 Obama-era ban on importing the body parts of African elephants shot for sport would be relaxed. The President said he reversed the decision because believed that the money generated from trophy hunting was not going into conservation projects, but "towards a government who was probably taking the money. He added that he also came to the decision because he "didn't want elephants killed and stuffed and have the tusks brought back" to the US, explaining: "I turned that order around, that was an order that I totally turned that around." President Trump is known for having a no holds barred approach to social media, often sending controversial tweets. The 71-year-old told Morgan that he often tweets himself, but will dictate tweets to someone else if he is too busy. The President is known for often sending many tweets early in the morning, saying he sends them "sometimes in bed, and perhaps sometimes at breakfast, or lunch, or whatever. "But generally speaking, during the early morning or during the evening."